Demonstrable governance and process that has a history of measurable traction. 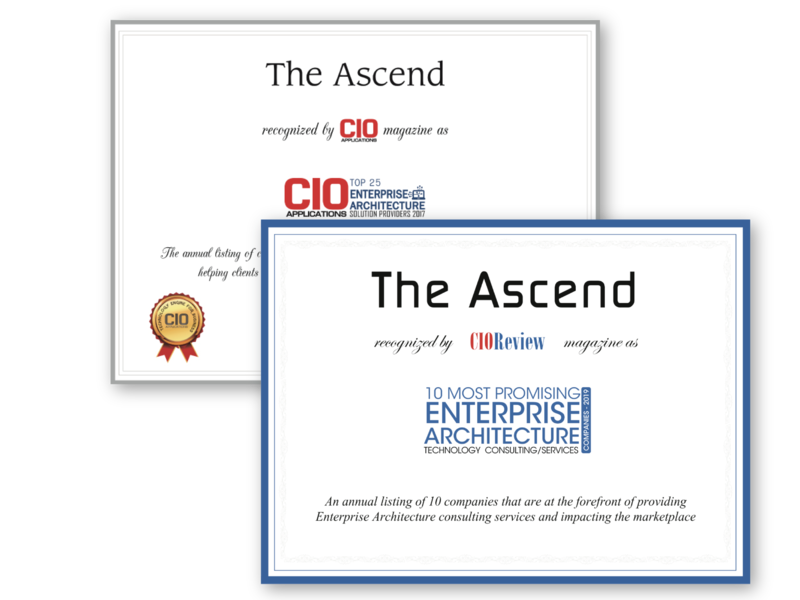 Ascend is a fast-growing, full service, business and technology firm creating tangible and demonstrable business value for our clients. Over 14 years of experience and expertise in Technology Leadership, Enterprise Architecture, Assessments, and CIO/CTO advisory and planning, we promise to deliver Pragmatic Insights-Predictable Outcomes. Ascend builds customer intimacy with pragmatic execution – our “agile and nimble” teams realizing strategy via tactical and actionable value, in less than 90 days and short-burst release cycles. Ascend provides an expert core team to spearhead projects. This core team includes 100% Principals / Senior Consultants have over 250 Man-years of leadership expertise in the core competency areas. Together, we bring in thought leadership & global perspectives to all client engagements. Ascend will bring business focus and visible value to you with its agile and integrated approach in delivering projects – we will collaborate and engage with you to define the success metrics required for the project. Until we both agree on the win themes, we do not rush to engage. This disciplined approach drives pragmatic insights and predictable outcomes to you.